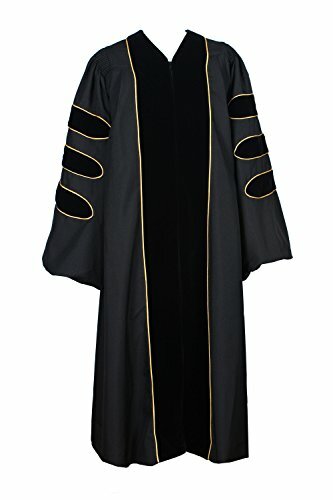 • Velvet on The Sleeves Width:2"
Our doctor deluxe graduation gowns are traditionally styled with two wide front pleats, two smaller side pleats and fluted across the back shoulders. Fluting provides fullness to the body of the robe and sleeves. It is the key to attractive and graceful draping. Made from high quality crease resistant, flat, lightweight material, the deluxe doctoral gown will absolutely help make your graduation day a lot more special. Our deluxe doctor gown is black and features black velvet panels and chevrons surrounded by gold piping. It has precision fluting with double lined bell sleeves. Excellent Doctoral Robe, Well Made, Durable and Heavy-Duty Material. 100% Plain Woven Polyester, Wrinkle Free. Features Full Length Wide Velvet Pleats, Gold Piping and Full Fluting on The Back & Shoulder and Bell Sleeve with Cuffs. Darted & Reinforced Shoulder Yoke. Hidden Zipper Closure with Hook Eye Clasp. Velvet Banner in Front, Three Velvet Bars on Each Sleeve. If you have any questions about this product by GraduationService, contact us by completing and submitting the form below. If you are looking for a specif part number, please include it with your message.